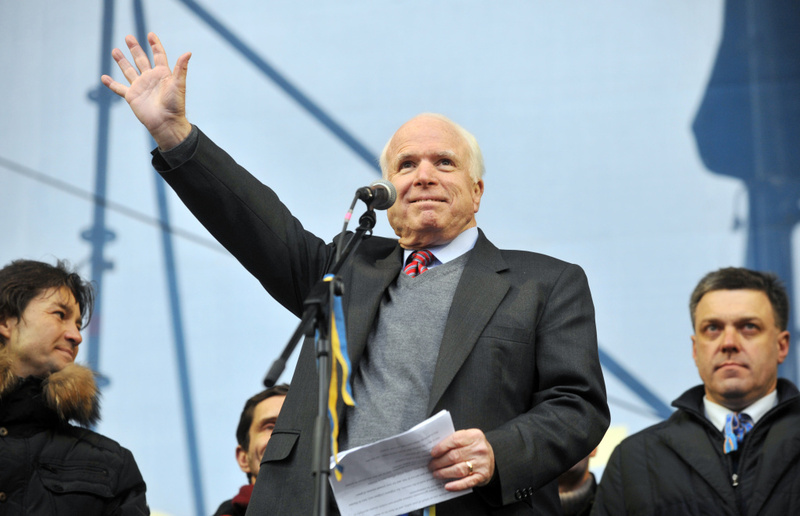 Sen. John McCain waves to protestors during a mass rally of the opposition at Independence Square in Kiev on Sunday. John McCain, US senator and former presidential candidate, died Saturday at his ranch in Arizona after battling brain cancer for more than a year. He was 81. He had discontinued medical treatment, his family said Friday. McCain was an outspoken voice on policy and politics to the end. He was a Vietnam prisoner of war camp and was later elected to the Senate from Arizona six times but twice thwarted in seeking the presidency. McCain’s service to his country began more than six decades ago at the U.S. Naval Academy at Annapolis and will end there in a cemetery overlooking Maryland’s Severn River. In Washington, McCain will lie in state Friday in the Capitol Rotunda with a formal ceremony and time for the public to pay respects. On Saturday, former Presidents George W. Bush and Barack Obama are expected to speak at a service at Washington National Cathedral. We discuss his life and political impact. Textual communication troubles: Are we overusing exclamation points?!! CA might legalize selling home-cooked meals - is it creating new economic opportunities or creating a public health risk?